The music feels calm, like it's the only thing awake and thinking in a quiet, sleeping world. ADNA knew from a very young age that she wanted to be a musician. 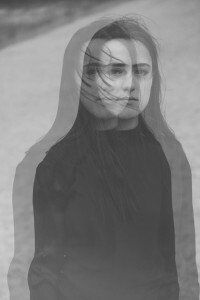 During music lessons in secondary school and later in music highschool, Adna started to explore the sensitivity and fragile moments of music, and this influenced her own songwriting and production. After graduating from highschool, Adna decided to move to Berlin in early 2014. The young, Swedish singer and musician released her first album ‘Night’ in April 2014. From her Berlin apartment Adna is working towards releasing her second album titled ‘Run, Lucifer’, which was released in spring 2015. On this album Adna combines acoustic sounds with electronic elements lead on by her powerful, yet delicate voice and the album as a whole has a fervent and grandiose sound. The titles of the 9 songs reveal that Adna will be inviting us into the most fragile, deep and melancholic corners of her heart. The record was written and recorded while moving to Berlin, in Adna‘s bedroom. The decision to move came from the need of finding her place and giving the music an honest try-out, and “Run, Lucifer” is the result of that. The record is co-produced by Simon Hagström Rennerstedt (Cassette Music Sweden) and mastered by Henrik Alsér (Svenska Grammofonstudion etc. ).